I love finding new venues to enjoy my favorite music performed live by my favorite bands. On June 16 I found a gem of a venue nestled in the heart of Wisconsin. Stout Ale House opened its doors to rock and metal music fans, and welcomed fans young and old to enjoy the original musical styling of a few of the music world’s fastest rising stars. The stars, who are they, you ask? 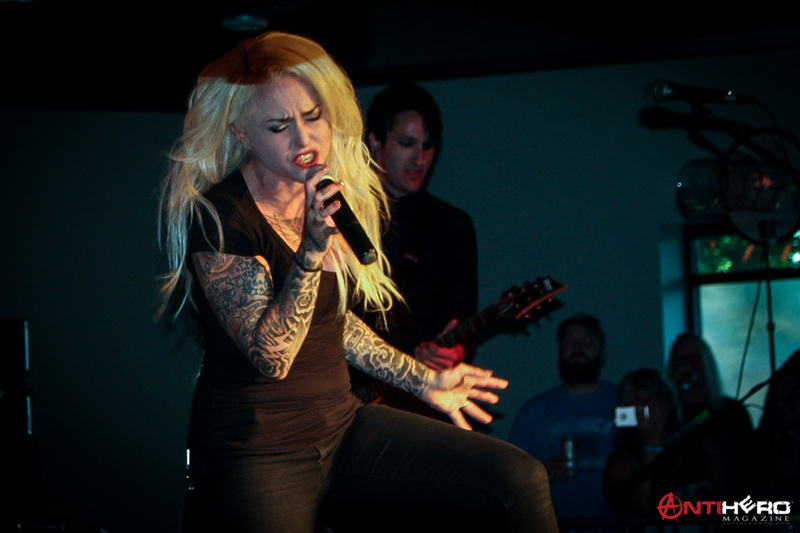 None other than “Mixi”-fronted Stitched Up Heart and the meteorically rising Pop Evil. These two made the stop in Menomonie, WI as part of Pop Evil‘s nationwide tour. The show opened with North Dakota’s Emissary Echo. A relatively new band to the rock/metal scene and still, in my opinion, wet behind the ears. The band seemed to be trying too hard to emulate other bands to really let their own unique sound shine through. There definitely is raw talent in the ranks of Emissary Echo, and the lead singer has a powerful, full-toned voice and he shows promise of being a top tier front man. The crowd reacted favorably to the originals penned by Emissary Echo, and I spotted show goers singing along, which is always a stellar sign of a band that has the potential to become highly relevant in the world of Rock music. 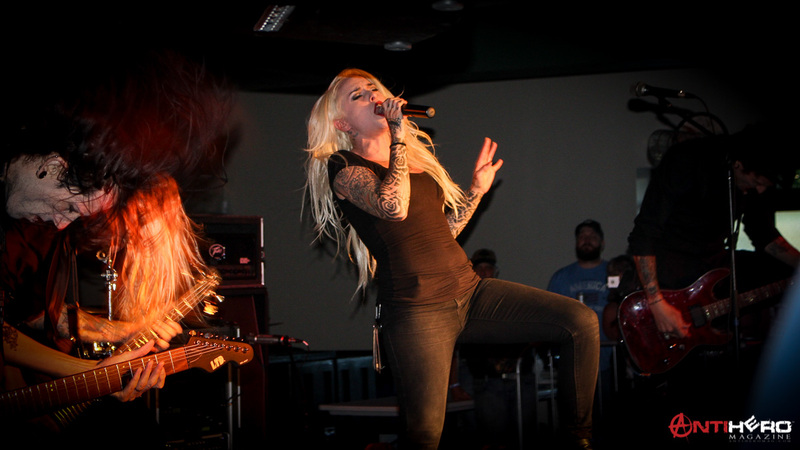 Stitched Up Heart swept on to the stage like the force of nature they are with frontwoman Alecia “Mixi” Demner taking her rightful spot in the center front. To look at her, you would never imagine the voice that erupts from that soul when she sings. Petite in stature, more beautiful than any runway model, and absolutely kinder and sweet than Miss America’s Miss Congeniality, it is not hard to believe she’s on her way to becoming a queen of Metal Music. Mixi’s voice is a whirlwind concoction of gritty melodic clarity; think Joan Jett, Annie Lennox, and Pat Benetar, but with more edge and force. Mixi is the voice of the future of metal, folks, mark my words. The men that share the stage with the dynamic Mixi musically blend together like a tightly woven tapestry of talent and creativity. Merritt, Randy, and drummer James Decker, are each seasoned pros and exude both humility and showmanship that keep fans coming back to live shows. The band played songs spanning their career but focused on new music from their newly release album, Never Alone. Stitched Up Heart will be coming to a town near you very soon with the always amazing Gemini Syndrome and 9Electric, so click on the links below and find out where the tour will be near you. I am going to suggest while you are link-clicking, click on the link to get Stitched Up Heart‘s new album, Never Alone, out now on Another Century. Assistant Extraordinaire purchased it the day it was released and said “It is really AWESOME,” so listen to him and get the new music. Now, on to the main event, Pop Evil. I am going to gush now, so get ready. Pop Evil was phenomenal, plain and simple. Hit after hit after hit was played to a sold out crowd. I watched as fans’ faces would light up as they realized that one of their favorite songs was a Pop Evil song. I overheard “Oh my god, I didn’t know they did this song! I love this song!” a few times that night. “Deal with The Devil” started their set, causing the crowd to go crazy wild, and the band kept delivering their major hits like “Boss’s Daughter,”‘ “Ways To Get High,” “Torn To Pieces,” “Monster You Made Me,” and oodles more. Leigh, lead singer, had the crowd in the palm of his hands, with his devastatingly good looks and smooth charm. Leigh’s axe slinging band mates, guitarists Dave and Nick, are the yin and yang of rock guitardom, balancing each other out perfectly and seamlessly. Matt, the bass player, has an aggressive style that makes his bass lines pop out where most bass lines from other bands tend to just melt away. I guarantee in five years I will interview a new up and coming bass player and he will cite Matt as the reason he started playing bass. I saved the crème de le crème of the band for last, drummer Hayley Cramer. 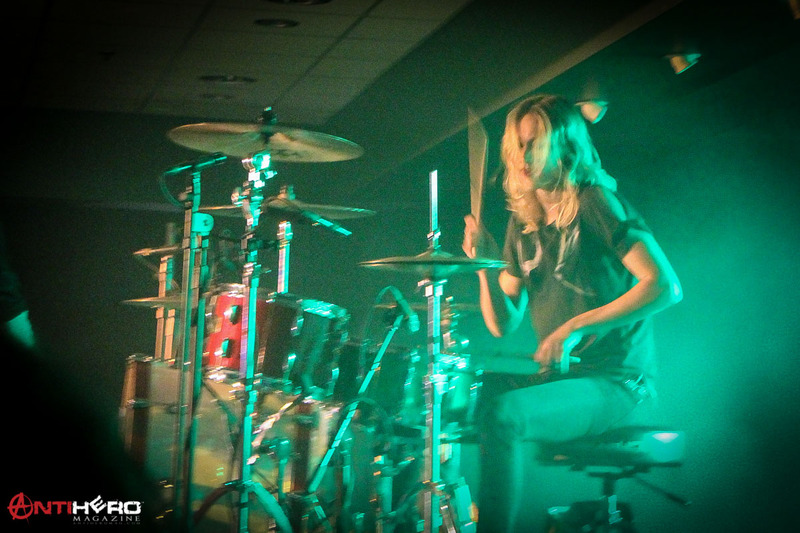 Hayley was just unveiled as the new drummer of Pop Evil in May, and the response from fans and the music world have been unanimously positive. I watched this stick wielder from side stage during the set and was astounded at her style and absolute precision. I swear she must have started drumming in utero. This woman is a combination of Neil Pert, Vinnie Paul, and John Bonham, don’t believe me, go see for yourself. Pop Evil is currently on tour, and I, being the sweetheart of a Skullgurl that I am, have provided links to find a tour stop near you. Wrapping up, go see these bands. Click the links, buy the music, buy the tickets, get your asses to a show. I also suggest if you are ever in the Menomonie area to stop by Stout Ale House and have a burger, do a little bowling, and have a beer. The staff at the Ale House are our kind of people dear readers, they love good music, they love a good time, and they are not a bunch of jerks!